Editor’s note: 12-23-2011: The Daily Mail has properly dated the article below. It was posted in 2003. The post initially appeared with the current date, but the Daily Mail has edited the post to show the original date. The article appeared current due to fast moving event surrounding Iran, most notably the covert undeclared war by the United States now underway in that country. Many readers, as evidenced by the comments below, are skeptical of this article because it was not covered by the corporate media in the United States. A Google News search does not produce a link, although the story was first posted by the Daily Mail in the UK. Other Alternative news websites and forums picked up the story yesterday (for instance, the liberal site, Democratic Underground). A search of the IRNA website, where the story allegedly originated, does not produce a match, either. However, this may be due to the fact Iran has in the past not publicized many attacks occurring inside the country and may have removed the article. We will continue to search for additional sourcing on this story to verify its legitimacy. As it now stands, the only source is the online version of the Daily Mail, the United Kingdom’s second biggest-selling daily newspaper after The Sun. Iranian President Mahmoud Ahmadinejad tours the oil refinery in Abadan during the inauguration of the plant in May, 2011. The Iranian news agency IRNA reported today that a U.S. missile hit an oil depot in the southwest village of Abadan on Wednesday. IRNA said British and American jets had entered Iranian airspace several times. In addition to the oil depot attack, two rockets reportedly hit the village of Manyuhi near the border of Iraq’s al-Faw Peninsula near the Persian Gulf and the Iraqi city of Basra. “In the border city of Arvand-Kenar, the invading American and British airplanes violated the airspace of the Islamic Republic of Iran three times,” a commander told the Islamic Republic News Agency. The governor of Abadan told IRNA that three people, including a guard at the oil depot, had been released from hospital after receiving treatment, reports Mail Online, the online version of the popular British newspaper the Daily Mail. No details were released on damage to the oil depot. 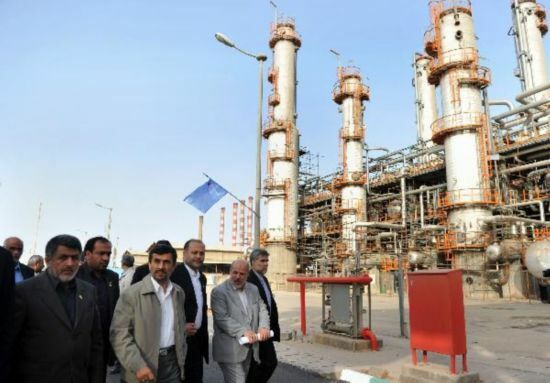 On December 12, Iran said its new Abadan refinery will raise its daily output of high-octane gasoline by almost 12,600 barrels by January 20, 2012. “Gasoline making and upgrading plans of Abadan oil refinery are going on respectively with 800 million and 3 billion dollars investment,” the Iranian Fars New Agency reported on December 13. In early December, Iran warned that any attempt to cut its oil production would more than double crude prices with cataclysmic result on a battered global economy. “As soon as such an issue is raised seriously the oil price would soar to above $250 a barrel,” Foreign Ministry spokesman Ramin Mehmanparast said in a newspaper interview.